These are suitable to be broadcast on TV /use in madressa . These are also available from www.Winislam.com on DVDs. Lecture 03(Zakat) Gandum, Jaw, Khajur ki Zakat(Zakat of Wheat, Barley, Dates and Raisins) by Maulana Shahryar Abidi. KHAREED AUR FAROKHT ( Buying & Selling) PLAYLIST ? 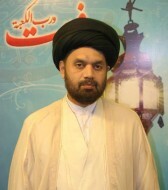 Lecture 14(Khareed-o-Farookht) Daarhi Mondna(Shaving Beard) by Maulana Shahryar Abidi.